Woohoo! Another vector from season 5 yet again. Night Glider is next. EDIT: THANK YOU GUYS SO MUCH FOR OVER 100 FAVES IN THIS VECTOR! Also you've been credited in the description of the video! Hi, I used this image in my upcoming movie "Friends MLP Style", a non-commercialized video on Youtube! You've been credited in the description, but if you'd rather I didn't use it please let me know and I'll take it down! Thanks again for the awesome vector! can i make a base out of it? but in my way and also creaditing you? Looks great ! Can I use it for a drawing I'm doing ? I promise to credit you. May I use this vector for a Gravity Falls parody? Sure thing, credit me for the vector! Hey mate if you don't mind me asking how did you get the cutie mark vectorized from an illustrator file to inkscape, cause every time I bring one in unlike an svg the whole Vector when I export it, its blurry I don't know why? Sugar Belle is so cute. She's my favorite character from season 5 so far. Looks really neat, but aren't the pupils within her eyes supposed to be black? I see. I guess black pupils are somewhat overrated. If only animators had the same idea. I hope they do that! Have you seen some of the back grounds in season 5 ;D ? Thanks! I do like them to. Its a bit different I should say. Yup, that style looks quite cute! Oooo~ getting better at this mate nice job! She's adorable! 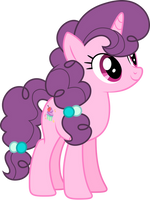 Sugar Belle was so adorable in that episode! ^_^ Nice work! The eyes are a bit off color... hehe... other than that... EXCELLENT WORK!!!! I intended to put a gradient on the eye color and made the black part blend in with the main color hehe but thanks!